I love reading scholarly studies of ordinary things. 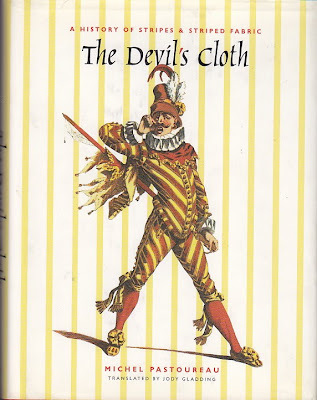 Michel Pastoureau, the preeminent authority on medieval heraldry, has written a book about “stripes", The Devil's Cloth. Who knew “stripes’ could be such a historical and fascinating subject. Pastoureau began his inquiry into strips as a young scholar when he began noticing that striped cloth was relegated to workers and jugglers and prostitutes and prisoners and even the devil, himself. In 1254, scandal ensued because of the striped cloaks of the Carmelite Order. They wore the robes in honor of their mythic founder, Elisha. As a chariot of fire was carrying him off, Elisha threw his white cloak to his disciple, but the fire burned the cloak and when it landed, it bore a singed stripe. The Carmelites wore the robes for 100 years before arriving in Paris where the stripes cause a scandal. The Church tried for years to bar the Carmelites from the barrés and finally, in 1287 the cloak was renounced in favor of an all-white cope. In 1295, Pope Boniface VIII instated an absolute ban against the wearing of striped habits for monks of all religious orders. 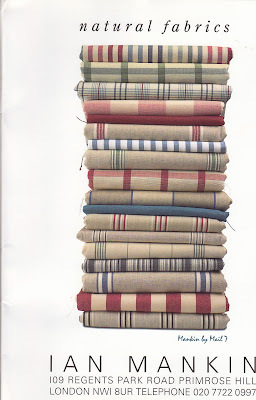 My favorite subversive stripe maker is Ian Mankin. 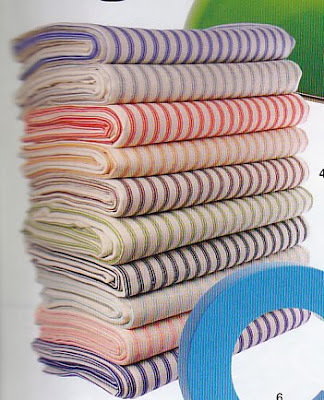 Every year, Mankin create the most wonderful palate of stripes including my favorite striped fabric, ticking. This year, he has developed a new line of organic linen ticking using low impact dyes. While the dyes have little impact, the colors are bold. You might mot be a monk or juggler or even a convict but I say, grab your favorite striped shirt and get out there and get subversive. I need to read this book. I LOVE stripes. When I mentioned how much I love ticking stripes to my mom once, she mentioned you do too!